The area ceded to the United States by Great Britain in 1783 (light brown) is usually recognized as the Eastern United States. 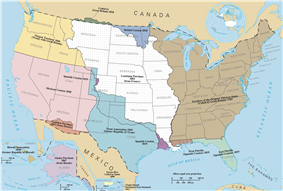 Louisiana and Florida acquisitions were recognized as the Western and Southern frontiers in early days of the Republic. Although east of the Rockies, Texas is considered Western. This video was taken by the crew of Expedition 29 on board the ISS. The pass goes over the eastern United States. In the last few decades, the Southern US has been attracting internal and international migrants. The American South is among the fastest-growing areas in the United States. Alabama, Mississippi, Florida, and Louisiana are parts of the Eastern United States which make up the area often known as the Southern United States. In one of the earliest English settlements in the New World, English Pilgrims from Europe first settled in New England in 1620, in the colony of Plymouth. In the late 18th century, the New England colonies would be among the first North American British colonies to demonstrate ambitions of independence from the British Crown, although they would later threaten secession over the War of 1812 between the United States and Britain. New England produced the first examples of American literature and philosophy and was home to the beginnings of free public education. In the 19th century, it played a prominent role in the movement to abolish slavery in the United States. It was the first region of the United States to be transformed by the Industrial Revolution. It is a region with one of the highest levels of support for the Democratic Party in the United States, with the majority of voters in every state voting for the Democrats in the 1992, 1996, 2004, 2008 and 2012 Presidential elections, and every state but New Hampshire voting for Al Gore in 2000. The Midwestern United States (in the U.S. generally referred to as the Midwest) is one of the four geographic regions within the United States that are recognized by the United States Census Bureau. The region consists of twelve states in the central and inland northeastern US: Illinois, Indiana, Iowa, Michigan, Minnesota, Ohio, and Wisconsin. A 2006 Census Bureau estimate put the population at 66,217,736. Both the geographic center of the contiguous U.S. and the population center of the U.S. are in the Midwest. The United States Census Bureau divides this region into the East North Central States (essentially the Great Lakes States) and the West North Central States. Chicago is the largest city in the region, followed by Indianapolis and Columbus. Chicago has the largest metropolitan statistical area, followed by Detroit, and Minneapolis – Saint Paul. Sault Ste. Marie, Michigan is the oldest city in the region, having been founded by French missionaries and explorers in 1668. The term Midwest has been in common use for over 100 years. Another term sometimes applied to the same general region is "the heartland". Other designations for the region have fallen into disuse, such as the "Northwest" or "Old Northwest" (from "Northwest Territory") and "Mid-America". Since the book Middletown appeared in 1929, sociologists have often used Midwestern cities (and the Midwest generally) as "typical" of the entire nation. The region has a higher employment-to-population ratio (the percentage of employed people at least 16 years old) than the Northeast, the West, the South, or the Sun Belt states. Four of the states associated with the Midwestern United States (Kansas, Nebraska, North Dakota, and South Dakota) are traditionally referred to as belonging to the Great Plains region. However, in recent years they are often included in the Midwestern region.